After pondering his paintings and ephemeral works for years, I thought I knew about all there was to know about Marcel Duchamp. Evidently not. The American artist-writer-curator Donald Shambroom has written a breezy but minutely detailed book, published by David Zwirner on the 50th anniversary of Duchamp’s death, entitled Duchamp’s Last Day. It provides insightful supplementary information by focusing on the last day and death of arguably the most influential artist of the 20th century. On October 1, 1968, Duchamp died at age 81, quietly and unexpectedly — as if by chance. A half-century after altering art forever with his subversive urinal readymade “Fountain” (1917), he passed away in the company of bathroom fixtures in his salle de bains at the Neuilly-sur-Seine home he shared with Teeny (Alexina Sattler), his wife since 1954. After moving Marcel to the bedroom with the help of Duchamp’s nephew, a doctor, Teeny called Man Ray and asked him to come right over. He did so with his elaborate camera equipment and the very last, long-lost photograph of Duchamp, “Marcel Duchamp on His Deathbed” (1968) was taken. Reproduced for the first time here with the permission of The Getty Research Institute, it is a highlight of the book. Soon Duchamp’s body was moved to Rouen in Normandy and buried in the family cemetery plot. Ever impudent, his grave bears the epitaph, “D’ailleurs, c’est toujours les autres qui meurent” (“Anyway, it’s always other people who die”). Shambroom reports that the phrase came from a handwritten scrap of paper Duchamp had carried around for years in the inner pocket of his coat. It aptly summarizes the artist — ever tongue in cheek, even in the grave. Shambroom tenderly examines the minutiae of Duchamp’s last day. The day had been delightful for him: he visited the Vuibert bookshop on the Boulevard Saint-Germain, posted a letter to publisher Pierre Belfond, wandered around the Left Bank and received a visit from old friend Georges Herbiet. 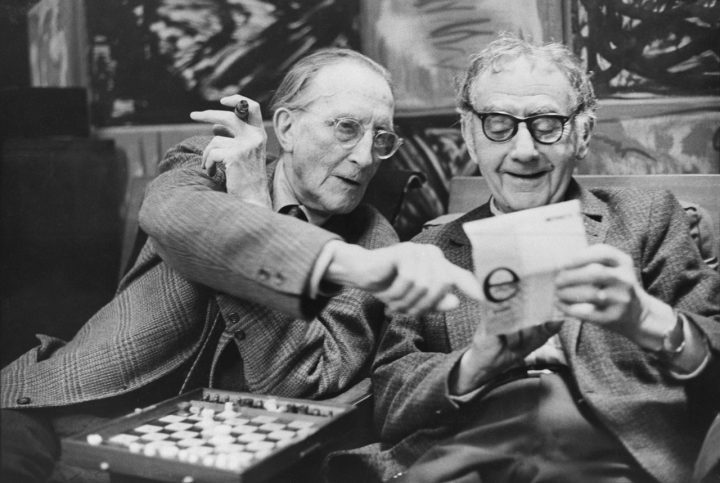 Shambroom reports that Herbiet and Duchamp cheerfully spoke about many subjects during that last rendez-vous, including chess, the peaceful death of Herbiet’s wife, and Duchamp’s plans to travel to Chicago for a Dada exhibit as a last hurrah. Teeny and Marcel then hosted a pheasant dinner for Man Ray, the writer and art critic Robert Lebel, and their wives, which was full of devil-may-care insouciance and morbid wordplay and spoonerisms. Lebel, a close, longtime friend of Marcel’s (see Paul B. Franklin’s The Artist and His Critic Stripped Bare: The Correspondence of Marcel Duchamp and Robert Lebel with foreword by Jean-Jacques Lebel) was instrumental in rendering Duchamp’s often hermetic conceptual work accessible to a wider public with the 1959 publication of his Sur Marcel Duchamp, the first monograph and catalogue raisonné devoted to the artist. By the mid-1950s, neo-Dada artists like John Cage, Robert Rauschenberg, and Jasper Johns had begun to champion Duchamp’s legacy, but Lebel’s tiresome devotion to Duchamp widened that circle considerably: 1963 saw Duchamp’s very first retrospective exhibition, at the Pasadena Art Museum, and in 1966 the Tate Gallery hosted a large exhibition of his work. Duchamp, a playful man, believed that the creative act is not performed by the artist alone, so Shambroom’s explanatory but probing tone is appropriate to the subject. However, the single-mindedness of the book takes something of a tangent in Chapter 4 when Shambroom brings up photographs Man Ray took of Amedeo Modigliani’s death mask, such as “Death Mask of Modigliani” (1928). Though there was no death mask made of Duchamp, Shambroom brings forth some provocative questions concerning Man Ray’s photograph “Marcel Duchamp on His Deathbed.” For instance, is this a Man Ray-Duchamp collaboration, a la the photographs that Man Ray took in the 1920s of Duchamp dressed as a woman, Rrose Sélavy (aka Rose Sélavy), which punned the French pronunciation Eros, c’est la vie (Eros is life)? (I say no.) Has the dead body of Duchamp been turned into a readymade by Man Ray? (I don’t buy that either.) Is it merely a photographic record? (Again, I would say no.) Or an artwork? (Yes, as it was staged and highly controlled by Man Ray, although he never showed it as an art print and instead filed it away as if archival material.) Although Shambroom’s address of the Modigliani death mask seems largely irrelevant, all of these questions are highly salient to thinking through Duchamp, as his central provocation to the question: Is this art? Aside from these philosophical questions, the book is generally factual, well-sourced, and well-illustrated, including a charming photograph by Henri Cartier-Bresson of Duchamp and Man Ray at Man Ray’s home that reveals their close relationship the year Duchamp died. Citing Robert Lebel’s 1968 essay “Last Evening with Marcel Duchamp” published by the Association pour l’Étude de Marcel Duchamp in 2006 in Étant donné Marcel Duchamp n°7, Shambroom’s fine-tuned prose is reliable while also recalling the tone of hardboiled noire. As such, Duchamp’s Last Day is an appropriately delightful au revoir to Duchamp. Like the artist, it is amusing and a bit dry — for example, Chapter 6 details how Duchamp had not yet paid for the Cadaqués bricks he had purchased for his irascible posthumous tableau, “Given: 1. The Waterfall, 2. The Illuminating Gas” (1946–1966), and the resulting hilarity. Judging by its sober design, its small scale, and its large mortality mission, you might not guess that Duchamp’s Last Day is as droll and as pleasurable as it is. Crack it open and the attentive reader is pulled between artistic intimacy and historic scale by a bravo performance capturing the ephemerality of life and the physicality of art. Duchamp’s Last Day by Donald Shambroom is published by David Zwirner Books and is available from Amazon and other online retailers. The post A New Book Probes Duchamp’s Last Hours of Life appeared first on Hyperallergic.